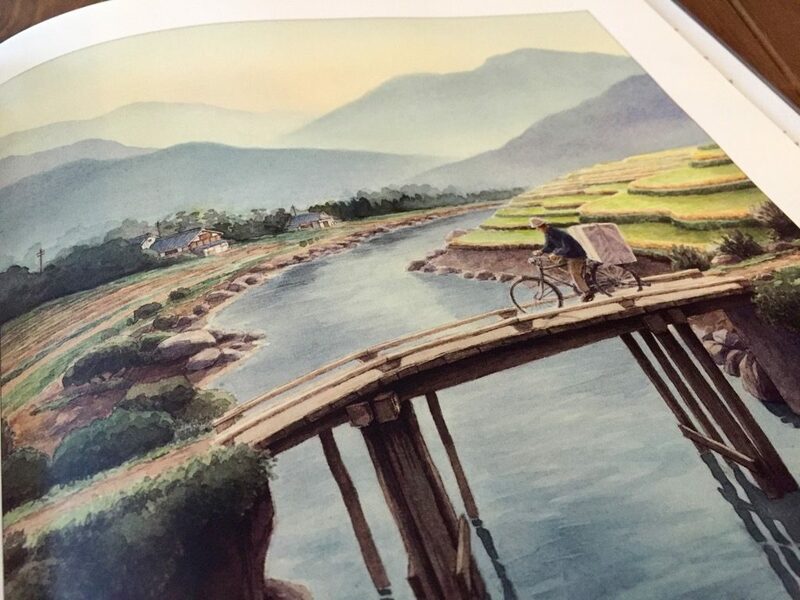 Allen Say’s touching story and breathtaking illustrations celebrate the long lost tradition of kamishibai picture storytelling in Japan. “After nourishment, shelter and companionship, stories are the thing we need most in the world,” observed the esteemed English author Philip Pullman. For untold centuries, storytellers were the only ones capable of fulfilling this basic human need. Long before the earliest stories were chiseled onto rock walls, storytellers shared them orally with the help of visual cues. Japan has its own rich and vibrant storytelling history. 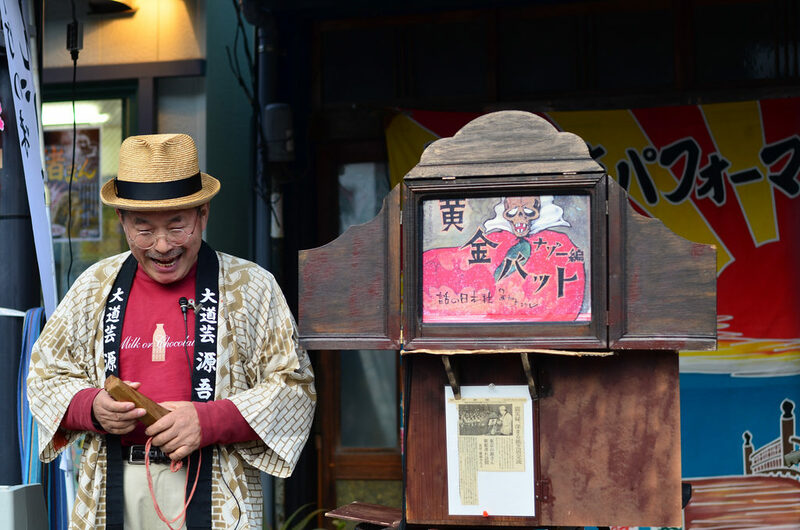 Kamishibai (pronounced kah-mee-she-bye), which translates literally as “paper theater,” is an all but lost Japanese tradition of telling children stories with cards. 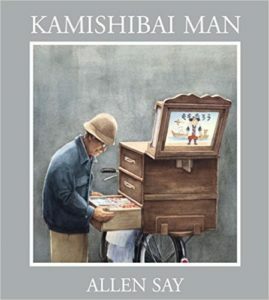 Author and illustrator Allen Say tells the story of these forgotten storytellers in Kamishibai Man (public library), a heartwarming children’s book filled with illustrations that capture the essence of this lost art form. In the introduction, the author shares his own experience with kamishibai. When I think of my childhood in Japan, I think of kamishibai. Every afternoon, the kamishibai man came on a bicycle that had a big wooden box mounted on the back seat. The box had drawers full of candies and a stage at the top. We bought candies and listened to the man’s stories. 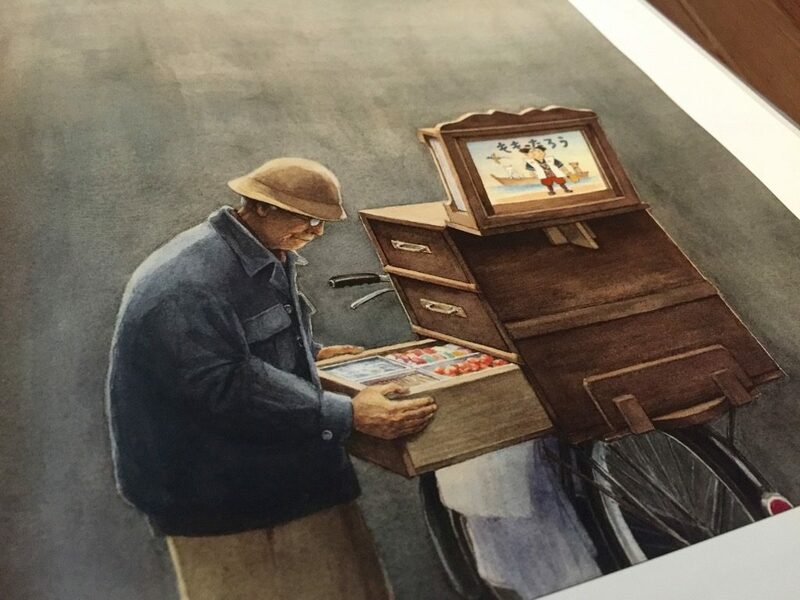 As he told the stories, the kamishibai man would slide out the picture cards in the stage one by one and put them in the back, like shuffling a deck of cards. The book is really two stories in one. It opens with a retired kamishibai man who decides to ride into the city and tell stories one more time. After he arrives and sets everything up, readers are treated to a flashback that features a younger version of the kamishibai man. The flashback shows a crowd of children gathering around the kamishibai man — all part of a day in the life of the younger kamishibai man. From the top drawer he took out two wooden blocks, and holding one in each hand he hit them together. A sharp, loud clack rang out. But then there’s a change. 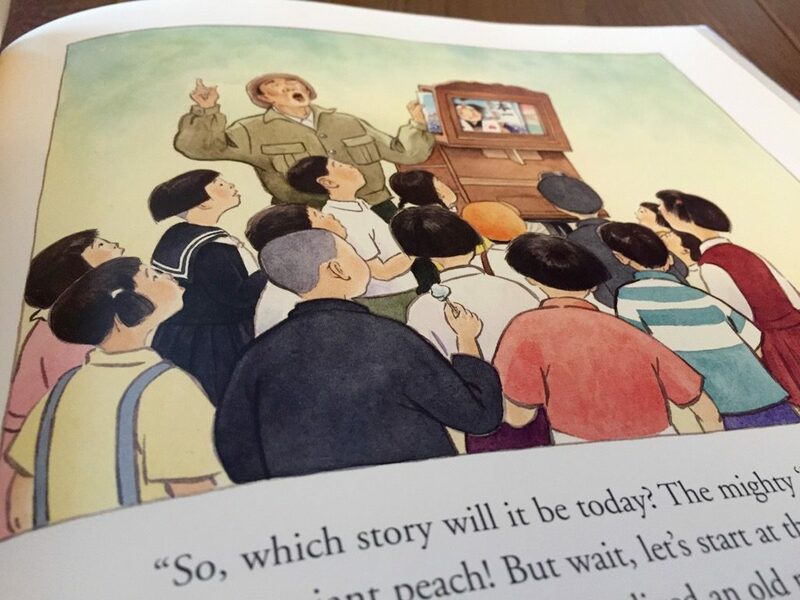 Televisions start appearing in households across Japan, and fewer and fewer children come out to hear the kamishibai man’s stories. The flashback ends with the kamishibai man telling a story to a single child. That’s the last day he was a kamishibai man. 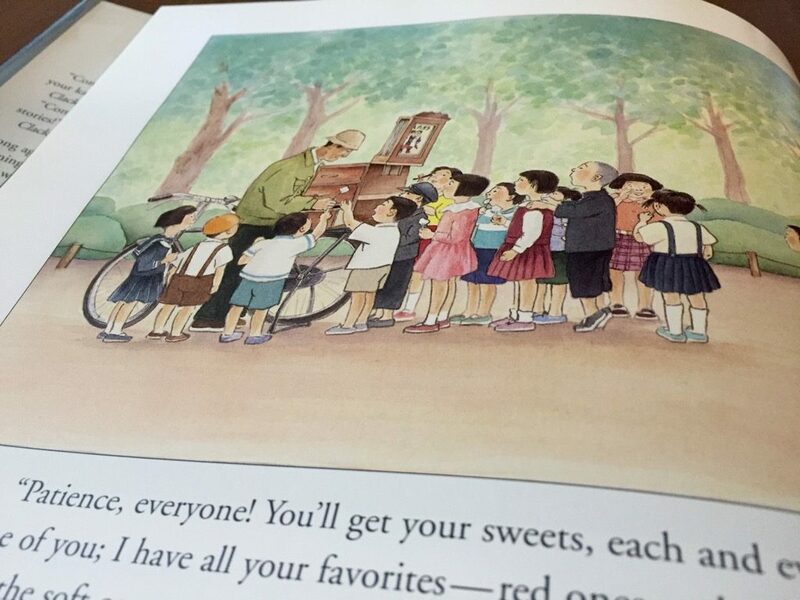 Japanese folklore scholar Tara McGowan says this is an accurate depiction of what happened in the 1950s. By the 1950s and the advent of television, kamishibai had become so popular that television was initially referred to as denki (electric) kamishibai. As Japan became increasingly affluent, however, kamishibai became associated with poverty and backwardness. The kamishibai teller’s candy was considered unsanitary and the stories unwholesome. Eventually kamishibai as a street-performance art all but disappeared. By the end of the book, the retired kamishibai man is surrounded by a crowd of adults — the same people who were children in the flashback — asking to hear his stories. That night the kamishibai man is on the evening news. It’s a fitting end to a story about a storyteller whose time has come and gone. The book apparently took a while to write. In an interview, Say said that he thought about writing this book for 32 years. I started thinking of doing a book about a kamishibai man in 1973 — it was going to be my second children’s book. I even had a title for it, The Paper Theater Man, but as I laid it out, I felt that I had to do too much explaining as to what kamishibai was and gave up. So this story gestated in my head for 32 years, a longish dream, even for me. Kamishibai has disappeared as a popular art form, but its story lives on in Kamishibai Man. Children are sure to appreciate the unforgettable history lesson in this beautifully illustrated cross-cultural book. Complement it with other books by Allen Say.